April 14, 2015, 12:30 p.m.
By Joseph Lichterman @ylichterman April 14, 2015, 12:30 p.m.
LONDON — For Callum Jones, a digital reporter at The Times of London, every morning begins with a 4:30 a.m. wakeup call. 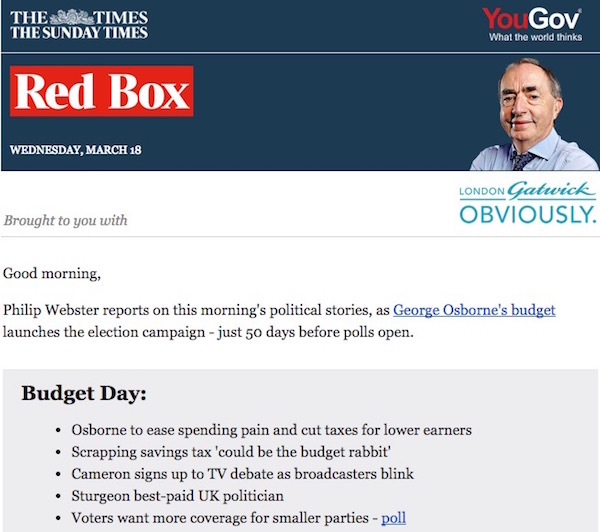 Jones is responsible for assembling and sending Red Box, a newsletter from The Times and Sunday Times that delivers a roundup of political news, commentary, and polling every morning. Red Box — which takes its name from the red box government ministers use to carry around documents — launched last August, and the free email now has more than 33,000 subscribers as Britain approaches the May 7 general election. But building the email also meant building tools — both to publish Red Box and to make it easier to create more email newsletters more quickly. Times developers began to build the tools Jones uses only a month or so before it debuted. It wanted something easy enough to assemble bleary-eyed early in the morning, but which was also responsive and flexible enough to be adapted to whatever its journalists wanted to actually put in the newsletter. 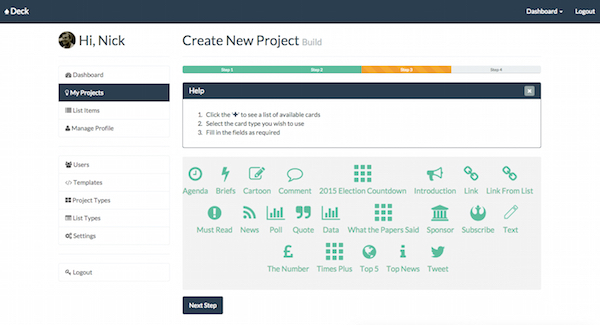 As a result, the developers built Deck, a modular system to build the emails. Each section of the email is put into a different card that’s customizable, so it’s easy to make a news story look different from an opinion piece and to add in features like a countdown to Election Day or a political cartoon. They can be drag-and-dropped into any order. Once the email template is built in Deck, it produces responsive HTML that can be copied and pasted into the Times’ email distribution system. Since its launch last summer, the Times has expanded the use of Deck beyond just the Red Box newsletter, and there are now 15 or so different projects built on Deck — from longform pieces that incorporate interactive elements to other newsletters, like a newly launched one from the Times’ business desk. “Effectively once we started work on this, we suddenly realized that the concept we came up with for Red Box, in terms of having a tool that’s modular and you could compile these cards…actually spilled out to a whole lot of other things we’re doing,” Chris Hutchinson, the Times developer who built Deck, told me when I visited the Times newsroom. 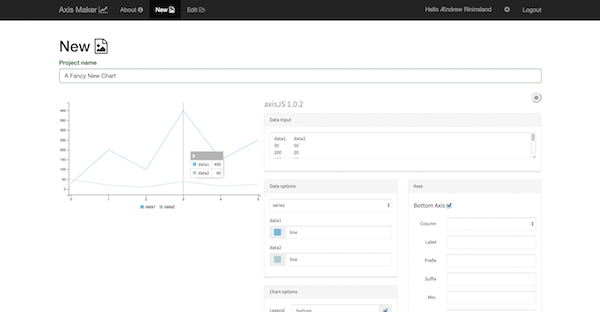 Among the elements built into Deck is AxisJS, an Angular JS charting tool built by developer Ændrew Rininsland. It uses a simple interface to take a data table from a CSV file and turn it into an assortment of charts and graphs. The tool is leveraged as a WordPress plugin, and Rininsland said Drupal compatibility is in the works. The Times has a deal with the research firm YouGov, and Jones uses it each morning to include polling data in the Red Box email. Charts created through AxisJS for the email newsletter are static, but it can create interactive versions for the web. The Times is also adapting it to its print style so designers can make graphics for the print newspaper without designing charts or graphs by hand. “Eventually, it should be able to take away a lot of that [busy] work so they’ll be able to focus on the much more complicated interactives that explain how MH370 went off course, as opposed to redrawing graphs, which is not a good use of their skills,” said Nick Petrie, the Times’ deputy head of digital. Similarly, last September after the launch of Red Box, the Times was looking for ways to draw attention to the new email product, so it built on Vox Media’s Meme tool, which can be used to create images to accompany tweets or other social posts. Off of that code, it built CardKit, its own version of the tool, which if released as open source last week. “We really liked what they had, but we wanted to add more images, multiple text fields, and a lot more control over what they did, and then theming on top of that,” Hutchinson said. Deck itself was inspired by and built on Sir Trevor JS, an open-source platform that came about through a partnership between ITV, the British commercial broadcaster, and Made by Many, a product development firm. The original platform only had six different types of modular blocks, but in Deck, the Times has created dozens of types of cards. The developers can also export the code and manually add features if staffers want to add something that’s not templated. The Times has extended the original Sir Trevor JS beyond any other organizations using it, and Petrie said the team was “starting to find the limitations in that,” adding that the Times was hoping to potentially collaborate with Made by Many to take it further. Axis and CardKit have both already been open sourced by the Times, but it’s still considering how to best to approach Deck. Petrie said the paper wants to refine it more before releasing it publicly, and it may do so as open source or as a paid-service with team-based logins. Still, Petrie emphasized that even though the Times’ reporting is behind a firm paywall, it’s committed to opensourcing its tools, not least because much of what it’s created builds on the work of others. 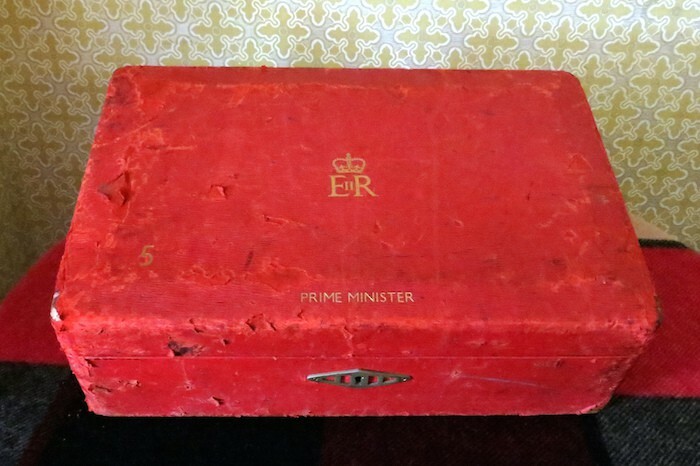 Photo of the Red Box used by the late British Prime Minister Margaret Thatcher by Becks used under a Creative Commons license. POSTED April 14, 2015, 12:30 p.m.
Lichterman, Joseph. "Its journalism is behind a paywall, but The Times of London’s developers embrace open source." Nieman Journalism Lab. Nieman Foundation for Journalism at Harvard, 14 Apr. 2015. Web. 23 Apr. 2019. Lichterman, Joseph. "Its journalism is behind a paywall, but The Times of London’s developers embrace open source." Nieman Journalism Lab. Last modified April 14, 2015. 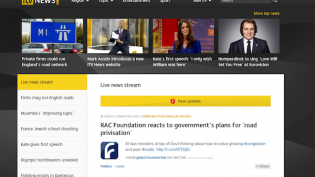 Accessed April 23, 2019. https://www.niemanlab.org/2015/04/its-journalism-is-behind-a-paywall-but-the-times-of-londons-developers-embrace-open-source/.